Pump strainers are often overlooked as a simple piece of equipment that doesn’t really affect your system. In reality, they are extremely important to maximize the lifespan and efficiency of your circulation pumps and keep your pool filtration system operating at peak performance. There are a lot of different strainers on the market, but the vast majority of them are simple T-Style strainers. A T-style is pretty basic and does catch debris, but it is far from the most efficient design. T-style strainers tend to load up quickly, and they can cause extra wear on pumps, reducing overall system performance. Strainers that load quickly and cause premature pressure loss can reduce flow rates, and filtration effectiveness. 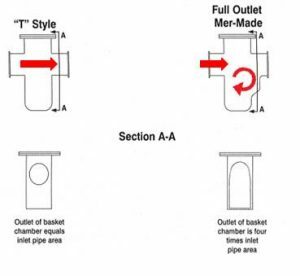 We recommend the Mer-Made FO (Full Outlet) series of strainers. The FO Series has a superior design; strainer housings are fiberglass-reinforced plastic construction, pressure tested to 50 PSI. They feature quick-opening latches, see-through acrylic lids, and 316 stainless steel v-wire baskets; all features that put the Mer-Made line ahead of the competition. Historically, strainers have been required to have a basket total open area that is a multiple of incoming pipe area. A generic strainer specification may call for a basket open area to be four times the incoming pipe area. Tests have shown however, that in many designs very little of the basket area is used before a maximum pressure loss, (typically 5 PSI) is achieved. The usefulness of the strainer basket is much more dependent on the amount of opening in the chamber that houses the basket – instead of the basket area itself. 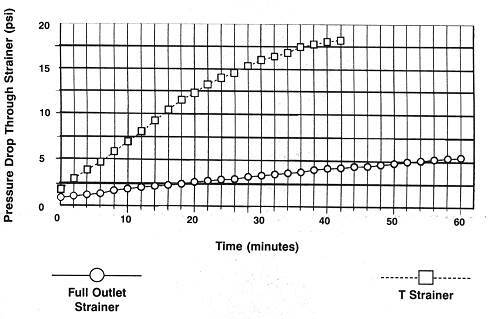 As you can see the pressure drop is exponentially higher with a normal T-style strainer. With that small area that catches debris, they really don’t efficiently strain anything! Frequent cleaning is required to keep a T-strainer operating well. The frequency may be so high that staff aren’t doing it and put pumps at jeopardy. There’s really no excuse to use a T-strainer when you are upgrading a system. There are even eccentric reducer body options available for improved hydraulics and reducing air pockets from larger influent piping. This makes it easy to retro-fit Mer-Made strainers without extensive re-plumbing. So in summary, a strainer is a bit more complex than we would initially think. 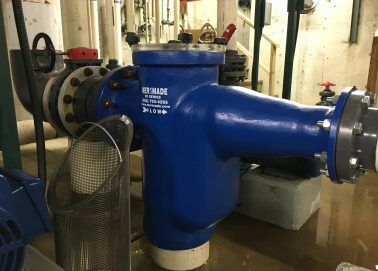 As the first step in your pool filtration system, strainers should be a key factor considered when building, upgrading and renovating systems. As always, feel free to get in touch with our team for more information.